I had never been impressed with the Atelier series before Atelier Rorona. The Marie and Iris games just kind of bored me. So I was surprised that I not only loved Atelier Rorona, but that at the end of 2010, I considered it the second best game of the year. So here I am, almost a year to the day, with the direct sequel, Atelier Totori. Has lightning struck twice, or is Rorona still the only Atelier game I’ve actually liked? Your main character this time around is a young girl named Totori. She lives in a small village far to the south of Arland and has been trained as a novice alchemist by Rorona, the heroine of the last game. Her true goal however, is to become an adventurer like her famous mother, who disappeared roughly a decade ago. Totori wants to become an adventurer and find her mother, and alchemy is her way of accomplishing this. You go through six years of Totori’s life, meeting new friends and becoming both a better alchemist and a warrior. There are tons of side stories, optional quests and branching storylines based on the choices you make and how you interact with the other characters. There are three main endings (Bad, Normal, True) and nearly a dozen character epilogues so there’s a nice amount of content here. The problem is that the game is made of up several small storylines without any one real big plot to tie the game together. In Atelier Rorona, you at least had a true reason d’etre – that of having to prove yourself as an alchemist with various tests or have your place shut down. With Atelier Totori you don’t get that. It’s all just completely open ended as you earn experience points and adventurer points. 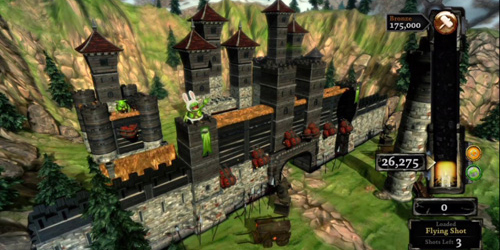 The former levels you up and the latter are the equivalent of in-game achievements or trophies for Totori. The more she gets, the higher her adventurer level is. I like the open endedness, but for the majority of the game, you aren’t given any real story. It’s just going on adventurers and hoping you unlock a bit of side story for some character. After four years, if you’ve done well enough, you can unlock the chance to build a ship and find your mother but really, this needed to be earlier in the game to give players some kind of motivation. Otherwise the game suffers from the same problem as The Legend of Mana, where people complained that there was nothing compelling them onward. The other problem is that while the game is open-ended, you will have to follow a specific timetable in order to achieve the Normal ending. Part of this involves beating a monster where you should be approximately Level 35 in both adventuring and alchemy. So if you’ve been specifically focusing on one rather than the other, you screw yourself out of the Normal Ending. The True Ending basically forces you to follow a walkthrough in order to achieve it as it is so specific there is no way to happen on it through sheer chance. It’s literally impossible to do so. Compare that to Atelier Rorona where the true ending was pretty easy to achieve as it was a matter of common sense. Finally, there is the problem that the game’s story requires you to be somewhat familiar with Atelier Rorona and you need to have achieved the True or Astrid Endings in order to get the full value of the game. There are constant references and in-jokes about the previous game, as well as story bits that will only make sense if you complete one of the higher endings in Rorona. Now as I played the hell out of Atelier Rorona, I loved seeing the continuity and the evolution of the characters (as well as the chance to use some of them again), but I could also see how the game was inadvertently punishing newcomers to the series. I have a problem with that as Rorona was extremely inviting to people who had not played an Atelier game before, while Totori isn’t. I really enjoyed the cast and characters of Atelier Totori and the game managed to make me sad at a specific point, which is something that rarely occurs between me and video games. Unfortunately, the character creates a contradiction itself by pretending to be extremely open ended but then requiring pretty specific actions and leveling up in order to achieve anything other than the bad ending. As well it relies too heavily on knowledge that could only be gleamed from having played Atelier Rorona first. As such, even though I enjoyed the story very much, I can’t deny that it is noticeably flawed compared to Rorona and you really do need to BEAT that game first to get anything close to the full effect in Totori. If you’re one of those gamers that loves to hate JRPGs for their static portrait based dialogue scenes, you’re going to be up in arms over this one. All the story bits are told in this way, along with full screen “paintings” when a pivotal plot point has occurred. These “paintings” are also a signal that you’ve just earned a trophy by the way. However, most of the artwork is very detailed and stylish and the animation in battles or towns is very well done. Personally, I’ve never understood the whole complaint about this style of storytelling, but then I’m old and I’ve grown up with it. Characters are wonderful. Everyone looks great and it’s fun to see the subtle (and not so subtle) changes to characters that were originally in Atelier Rorona. I really enjoy the design of the new characters and Totori herself is especially adorable. The only real negative thing that I can say about the character designs is that Peter looks more like a gangly scarecrow or marionette rather than a person. He just looks out of place compared to everyone else in the game. 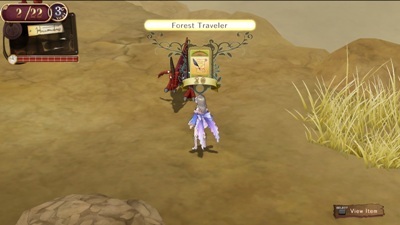 Most of the monsters in the game are direct repeats from Atelier Totori without any visual update at all. This was a bit disappointing, but at least the new monsters are pretty impressive, especially the bosses. Finally the backgrounds and scenery are beautiful, even if a lot are once again recycled from Atelier Rorona. it would have been nice to see Gust put a little more into this instead of relying on visuals from the previous game, but what’s here is still quite pretty. Because of the return of several characters and/or locations, it makes sense that the graphics stay the same. Overall, what’s here is pretty but Gust could have done a bit more with the two year gap between games. I was really happy to that the characters from Rorona retaining their original voice actor or actress. This is especially true for Pamela as she’s changed in every game beforehand. This is another great nod to continuity in this game. The new characters sound just as wonderful as the original crew, although my girlfriend kept thinking Totori was Flonne from Disgaea. Even with the earlier Atelier games that I didn’t care for, I was always impressed with the voice acting and soundtrack in those titles, and Atelier Totori keeps the streak going. Speaking of soundtracks, the music here is incredible. Again, some of the tracks are reused from Atelier Rorona, but I’m fine with that as I adored that score. The new tracks are quite catchy and I found myself humming along with them even if I didn’t get the stuck in my head after the game was turned off. It’s interesting to note that unlike the score you might find in a high fantasy RPG, the music here in Atelier Totori is far more subdued in tone and yet “peppier” at the same time. The music fits the game wonderfully, although it’s doubtful it would be as well received in a different game. It’s all about matching the tracks to the game and the composers for both Rorona and Totori deserve props. One last note, in my Atelier Rorona review, I bitched that the Collector’s Edition of the game didn’t come with a soundtrack. Well, Nippon Ichi seems to have listed as the CE for Atelier Totori does just that. Considering the high quality of the score and the fact the premium edition of this game costs as much as a regular PS3 title, there’s no reason not to go for the higher end model. The soundtrack alone is worth the investment. 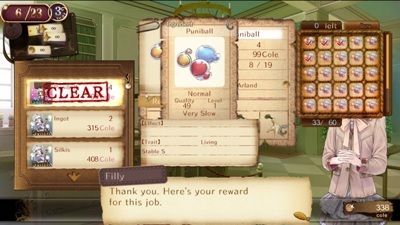 Although many of the trappings in Atelier Totori are similar to those of Atelier Rorona, don’t be fooled into thinking you should play the game in a similar manner. If you do so, there’s a good chance you’ll end up with the Bad Ending instead of the Normal or True. Both games feature an open ended system where you’ll have to juggle turn based RPG Battles, alchemical creations and time management in addition to relationships with specific characters in the game. Both games also feature roughly the same system and engine for doing so, but the devil is in the details so let’s take a look at how the games differ from each other. First up, there’s an obvious clue in the titles. With Atelier Rorona the subheading was The Alchemist or Arland. With Totori, it’s The Adventurer of Arland. The titles are noticeable different for a reason>With Rorona, the emphasis was definitely on alchemy first with adventurers and combat playing a more secondary role. 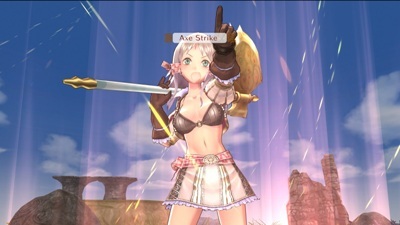 With Atelier Totori, combat and exploration are in the driver’s seat as you’re going to NEED to have a really strong team of warriors to get both the Normal and True endings. Alchemy is still important, but it’s definitely secondary to grinding up your characters. Compare that with Rorona where all you needed to do was spend the entire game just doing alchemy and occasionally leaving your house for items and you can see how wildly different the two games will feel, even though the core of both titles are exactly the same. It’s impressive that Gust was able to make the two games feel so similar and yet so different at the same time. That’s the hallmark of a really well made engine. Another change is the fact you no longer have to pay money to hire allies. Instead, they all join up with you for free. This is a VERY welcome change and one the game itself admits was a mistake in Atelier Rorona in a very funny story scene that occurs when you have Sterk and Rorona as allies. Yet another is that in addition to your Alchemist and Adventurer experience levels, you also have an Adventurer’s License. This License levels up somewhat independently from the other two systems and yet uses them both. The License System is broken into four categories: Battles, Exploration, Alchemy and Quests. If you look in each category, you will find several things that you can do to earn license points. For example, fighting a Griffon Boss nets you thirty points or mastering all the alchemy items in a book can net you five. There are other hidden things you can do as well to earn points as well and when you achieve them, a little blip will show up on the screen telling you what you have done and how many points you have earned. The system is definitely skewed in favor of Battles and Exploration over Alchemy and Quests but that’s on par with the rest of the game. If Atelier Rorona wasn’t skewed in the opposite direction I might have had a problem with this, but instead I think this makes a nice contrast between the two games and allows gamers to have it both ways. As you level up your license, you unlock perks for your character like extra hit points or damage resistance. You’ll also unlock new places to travel. This lets you find new alchemical items and new monsters to collect. It’s important to get your license up to a certain level by a certain point in the game (trying to avoid spoilers) or you’ll get the bad ending. It’s pretty hard not to do this however as I had my license up to that critical point with more than a year to spare. Maxing out your license however, takes an enormous amount of work. All in all, the engine behind Atelier Totori is wonderful. It’s even more time management intensive than Rorona and it’s more about combat than alchemy, but the subtle (and not so subtle) changes make the engine superior to last year’s game, even if the story isn’t. It should take you about twenty hours to beat Atelier Totori. However, that means you’ll only be getting of the three main endings and perhaps NONE of the character endings. It all depends on your play style and what you want out of the game. You can easily go back and play through the game several times, only to discover new things, such as scenes based on a party combination or scenes you might have missed because you were out travelling on a specific day. There is so much to see and do here that the short length of this game (for an RPG) underlies how much content there really is. Due to the intensive planning and multi-tasking you have to do to get the true ending though, it’s probably best if you play several other titles in between each playthrough rather than trying to get every ending back to back to back. Balance is an odd duck here. Unlike Atelier Rorona which was far more open ended, Atelier Totori has more intensive requirements to get anything other than the Bad Ending. Time Management is far more important and the game is far less forgiving in this respect. The same is true for specific ally epilogues to your chosen ending. Because of all this, the open ended sandbox like appearance of Atelier Totori is merely an illusion as the game consistently pushes you to play in a certain manner or do certain things at a certain point in time. The game will also throw you regarding the difference in friendship requirements between it and Atelier Totori. If you try to play this game like Rorona, you will end up missing most, if not all, of the character epilogue endings. You see, in Rorona, you could easily max out a friendship rating to 100 by creating specific items your friends wanted. In Totori, the friends occasionally drop by in a random fashion and ask for something you already have made. This means raising the friendship is mostly by luck or by taking them on adventures. Adventuring gives far less friendship that items though and it’s a slower process, so if you’re trying to max out even a single friend to 100, you’re going to have an exceptionally difficult time here. Now the good news is that for nearly everything, you only need a 60 or higher rating for endings or specific events, which is much easier to do. Again, because the two games are so similar, the urge to play them the same way is almost instinctive, but to do so pretty much nets you an unhappy end to Totori. Finally, the timeline for the game can get a bit wonky. There are times where you may be in the middle of a quest and are forced to go somewhere else. As quests have time limit and even forced actions take time, you can fail your quests because of this. As well, the Adventurer License layout is a bit odd. For example I had enough points when to skip a rank on two occasions. The game also limits your level to Diamond in the first four years of the game. By the time you can level up your license again, you’ll have enough points to level it up twice in a row. It’s a bit odd how they did it and it could have used some tweaking, but it’s the first time Gust has tried something like this so I give them a pass here. The last issue is with the islands. You can’t hit up the islands until the last two years of the game and that gives you a massive time crunch to try and do everything there. This is arguably the most important part of the game and I feel this could have been implemented better if the ability to start this part of the game happened when you hit a certain number of license points rather than a rank AND a late start date. Players wouldn’t feel as rushed and thus be able to enjoy this more than constantly worrying about the clock. Will all this in mind, Atelier Totori offers an incredible amount of freedom. You can play the game however you want, do quests, make items, kill monsters and make your party however you want. The game does feel more constrictive that Rorona but it is still far more open ended than 99% of the other RPGs out there. I love that you can develop Totori in three distinct categories and build your character how you want her to be. You have a great deal of control here and your success is determined solely on two things: how good you are with time management and your ability to multi-task. This is the nineteenth game in the Atelier. Let me repeat that number. NINETEEN. So you would think the series would get a bit old by now. However, the games have changed so much over the past few years, you could barely tell that this and say, Atelier Iris are in the same series, save for the name. Even if you go back to Atelier Annie, which was the 2009 entry into the series, Rorona and Totori are VERY different games. Gust has done a far better job of keeping the Atelier franchise fresh and innovative than most developers out there. 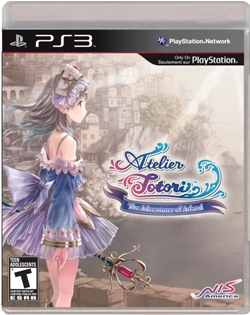 At the same time, Atelier Totori is VERY similar to Atelier Rorona. The game even reuses a lot of the visuals and music from Rorona to the point where some might cry foul over this. 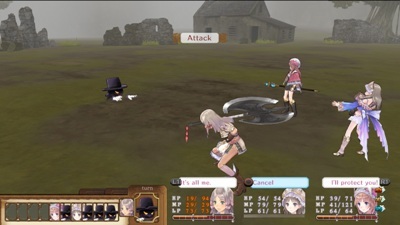 There are noticeable differences between the two, such as Rorona favoring alchemy and Totori favoring combat, but the core engine and gameplay is about 90% the same. Still, the ten percent that is different really changes how you think about (and play) the two games. 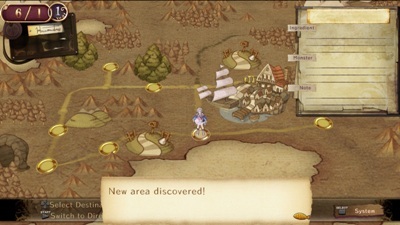 It’s different enough from Atelier Rorona that fans of the Atelier series will be able to post at length about it, while similar enough that detractors can make a solid argument that Totori is too much of the same thing as last year’s game, making it the RPG equivalent of a Madden football game. Both sides are right and neither side is wrong, so let’s call it a thumb’s in the middle here. After nine years of reviewing games professionally and six years of working directly in the industry, it’s no surprise that it takes a lot to impress me these days. If it’s just the same old thing or too similar to something else, it’s hard for a game to keep my attention. I need a game that really stands out from the pack of what else is out there if I’m going to enjoy it rather than just review it. Atelier Rorona was one of those games. It was so different and yet utterly charming, so I feel in love with it. Hours would fly by without me even realizing it. I found myself utterly absorbed and made mental notes in my head of how long it would take to make something or how much time would be spent on an adventure. It was pretty intense. Atelier Totori affected me the same way, but it was far more subtle. I had a hard time putting down the controller. I just wanted to keep playing. However, I’d look at the clock and it felt like I had played the game longer than I actually had. At first I chalked this up as a bad sign, because generally when you’re not enjoying something, things slow down. The truth was that this was simply because Atelier Rorona was a much longer game to play through – about thirty to forty hours, compared to the twenty it takes for Totori. So I was putting the same percentage of time and passion into the game, but I didn’t realize how short it was until I beat the game and saw that I was only at the twenty hour mark. I loved Atelier Totori not only for the changes to the engine and how different the game felt when combat was the emphasis, but I loved revisiting the characters from Atelier Rorona and seeing what had changed and what had stayed the same. It was great to see them all again and I enjoyed the continuation of everyone’s story. Of course, if I had picked up Totori without playing Rorona first, I probably wouldn’t have been as addicted or enjoyed the game as much, simply because a huge part of the game would be lost on me. 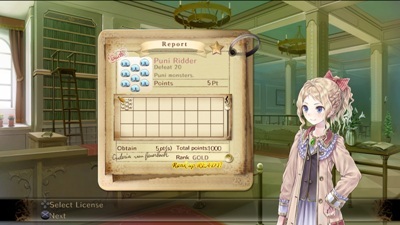 If you’ve played Rorona first (and loved it), you’ll probably be as addicted to Atelier Totori as I was. Although Atelier Totori sold extremely well in Japan, I’m not sure how well it will do here. Atelier Rorona sold decently and has a definite fanbase, but it wasn’t a best seller by any means. 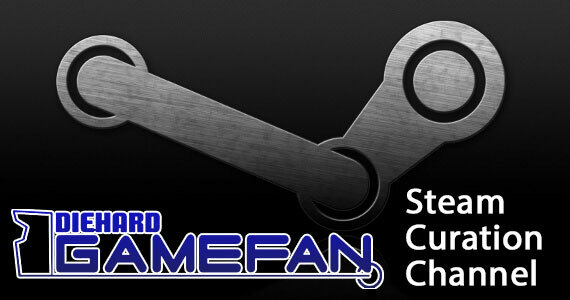 It was just a nice little exclusive for PS3 owners. 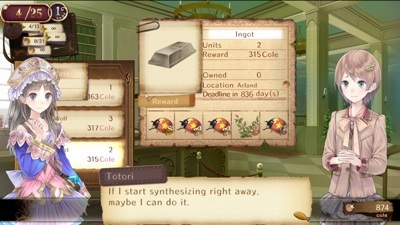 Totori is a better game in terms of engine refinement, but it’s not as good storywise. 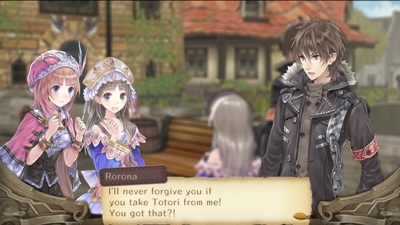 As well, Totori is really a game where you need to have beaten Atelier Rorona to get the full value out of. In this sense it’s more of a continuation than a sequel or a game that can be played on its own. It’s a very fun game, but it’s not something that can truly be taken or appreciated on its own. 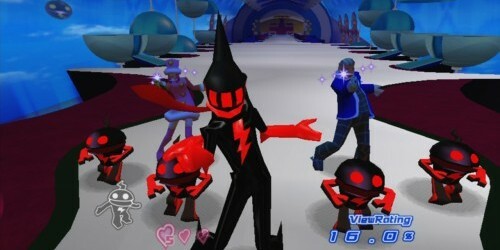 The best comparison would be to Digital Devil Saga 2: Avatar Tuner. Both it and Atelier Totori are games that are at their best when you play the original game first. Otherwise so much is lost. I honestly can’t recommend it to people who haven’t played Atelier Rorona, but at least you can pick that up cheap these days. The time management/RPG hybrid aspect of the game will also be a turn-off to some. It’s so different from the traditional RPG that it may elicit a bit of culture shock. 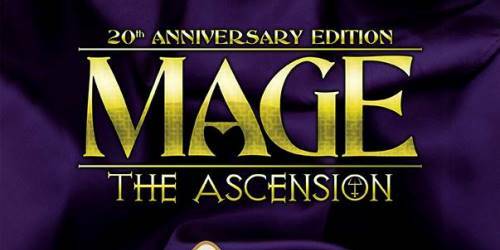 It’s going to be a very niche game with a small but very appreciative audience, but the way the game progresses combined with the odd juxtaposition of being opened ended and yet with a time limit will keep fans of more traditional RPGs at bay. Overall, Rorona fans will love Totori and everyone else will want to skip it. At least until they’ve played Rorona themselves. Nippon Ichi has done another great job with their Collector’s Edition here. This time, you’re getting an art book and a CD with the game for the same cost as a regular PS3 release. If you’re not a fan of collector’s editions, then you can buy the no frills package for only $49.99 – ten dollars less than a regular PS3 release. So you’re getting a high quality package for an incredible deal. You can still find the Collector’s Edition of Rorona for $39.99 these days, so for a few pennies less than a C-Note, you can get both games. It’s definitely a good deal and the way to go if you’re at all interested in Totori. I really enjoyed my time with Atelier Totori and it’s one of the better games I’ve played this year. I’ll admit I enjoyed Rorona slightly more, but Totori is definitely a game that needs to be experienced – especially if you’re looking for something that really stands out from the pack of turn based JRPGs released every year. Atelier Totori: The Adventurer of Arland is a wonderful continuation of the story that began in Atelier Rorona, but make no mistake – to get the full value and enjoyment out of this game, you need to have completed Rorona and received the True or Astrid Endings. Otherwise a good deal of what is being told will be lost to you. Because of that, it’s hard to recommend this game to people as their first Atelier game, but it is a highly enjoyable fare, featuring excellent voice acting, a charming soundtrack and an engine that improves upon last year’s version. Gust has made tremendous strides since transitioning from the PS2 to the PS3 and I’m already eager to see what the next game in the series holds for us. Atelier Rorona’s LE came with a Soundtrack though. I should know as I got the NISA Premium. It was the NISA bonus if I remember correctly? I can’t say that you could get through Rorona with ‘common sense’ and pull off the true end. And I definitely will not say that ‘common sense’ isn’t all you need to pull off a normal end in Totori. To get a True end, yeah, there are difficulties there, but that makes it more interesting. It’s EASY to get most of the character ends. And it was pretty simple to pull off the Normal End. I didn’t use a guide at all to get it. I was going for Mimi’s end though, and she is the trickiest of all the endings (similar to how Cordelia was the trickiest on Rorona. Them Tsunderes xD), so I got stuck with the normal end, and no character ends. I actually felt Totori had a stronger story than Rorona. Rorona’s entire plot was summed up in ‘don’t lose your workshop’. Which didn’t amount to much interesting or moving scenes. There were some, but there were just so many more scenes that really touched me in Totori. Which makes it so I don’t mind watching them again. All that said, if it isn’t already apparent, this would be my vote for PS3 Exclusive of the year! 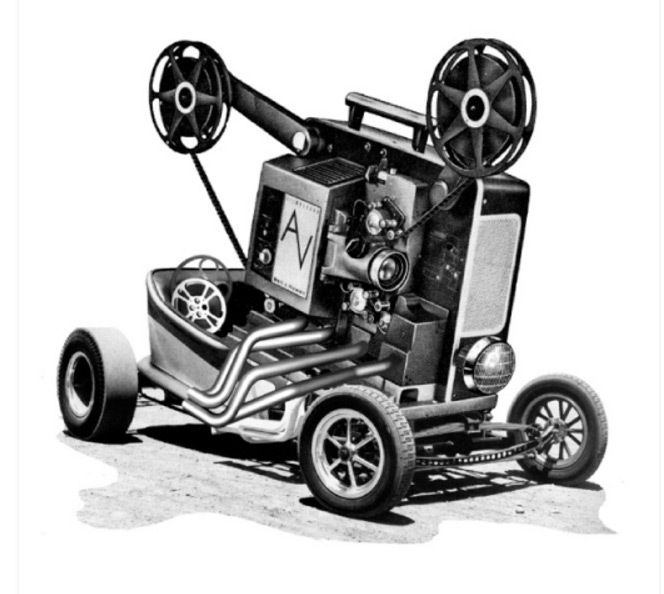 Do you know what engine they used?